Trump can’t call this fake news. 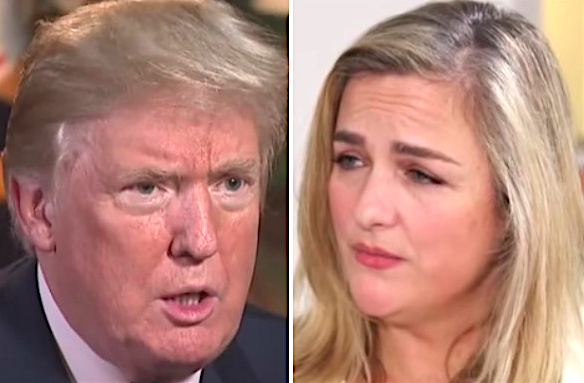 President Trump claims he’s never met journalist Natasha Stoynoff. But People Magazine can demonstrate otherwise — via a photo showing Trump standing right next to her at his Mar-a-Lago resort. The picture was taken the same day Stoynoff says Trump cornered her against a wall and forcibly kissed her. Trump’s wife Melania was pregnant with their son Barron at the time of the alleged incident. Stoynoff met with Trump and Melania in 2005 for a joint interview and photo shoot when the incident happened. It wasn’t until October 2016 that Stoynoff revealed publicly for the first time what happened. Trump’s knee-jerk reaction to his accusers comes amid the ongoing #MeToo moment, which has toppled powerful men in the media, business and politics. At the press conference Monday, four accusers called on Congress to investigate the accusations and expressed concern that other men were being held accountable for their alleged behavior while the president remained exempt. In a tweet from this Tuesday, Trump accused Democrats of “fabricating” the accusations. The way momentum is building, Trump’s history of sexual misconduct may come back to haunt him faster than anything Robert Mueller is investigating.